Sony has announced its 5-inch Sony Reader Pocket PRS-350 ebook reader at IFA as well as a revamped version of the bigger 6-inch PRS-650 Reader Touch. 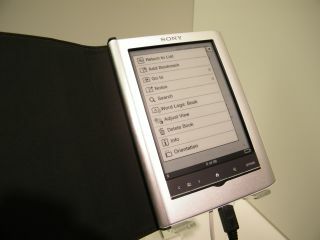 The Sony Reader Pocket and Touch UK release date is 17 September. All the Reader models have touchscreens, which you can use to swipe between pages in a book. Sony says it has improved the quality of the E Ink Pearl electronic paper displays from the earlier generation Readers, making them better for reading from. The Reader Pocket Edition PRS-350 is available in silver and pink, while the PRS-650 (which takes over from the older PRS-600) is available in black and silver. The cases are all aluminium. Sony says the screens are highly responsive yet we didn't find this when trying to select a book or other item on the screen. However, moving between pages does only require a lightweight touch – we wonder if maybe a little too lightweight. Talking of lightweight, the new Readers weigh staggeringly little – 215g. Like the last-gen iPod nano, it almost feels like there's no weight to it at all. Each has 2GB of memory which, Sony says, will take up to 1,200 books. You're also able to look up words and phrases from the Oxford Dictionary, while there are also ten translation dictionaries. The Touch Edition offers expansion slots for up to 32 GB of additional memory. There's also a more intuitive zoom function, enabling you to hone in on interesting content, adjustable contrast and brightness control, as well as automatic multiple page creation.